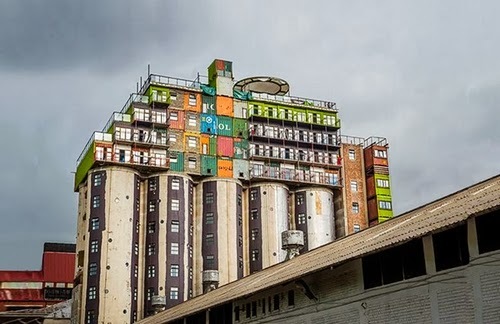 South African Property Developers Citiq saw the the opportunity to refurbish unused Grain Silos and pairing them with recycled Shipping Containers to produce low cost accommodations for cash strapped Students in Johannesburg, South Africa. The project only took a year to complete providing 375 Apartments on an 11 storey structure. Both the Silos and the Containers were fitted with windows to make them liveable with balconies on the containers. More information in the article under the images. Via jetsongreen. If you like this article, have a look at Recycled Container House. 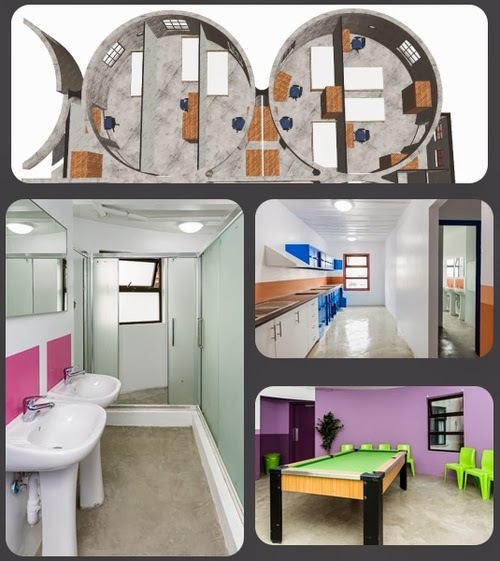 Apart from the private units (student rooms), the complex also contains several common areas, such as study rooms, a library, communal kitchens, and a gym. Citiq turfed the roof to add another common space with fantastic views of the City. Above are examples of single and double bedrooms, they both look spacious and light. 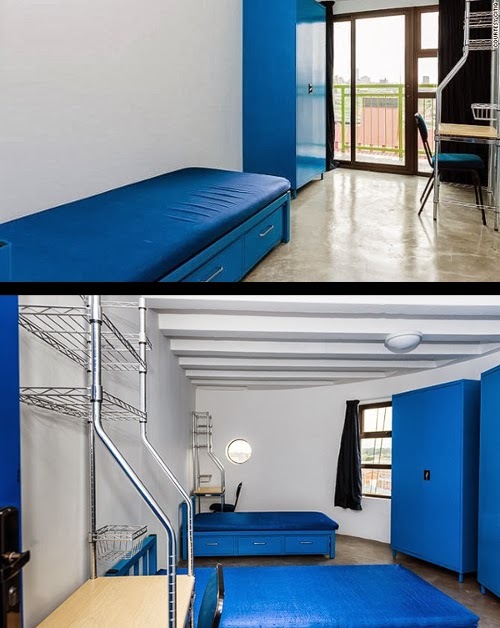 Two people sharing is $244 per month per person and a single standard room is $267 per month (when I made the conversion form the SA Rand to US Dollars, I thought I got it wrong so I went back to the site and checked the conversion and it is right). Heat pumps (for the hot water) and motion sensor coupled with energy efficient lighting, help the the cost to be kept very low. Further more insulation and double glazing provide an overall saving of about 50% on the bills. All these savings are passed on to the Students and it is hoped will help counter the high drop-out rate of South Africa's Universities. Above, examples of three different common rooms. They look minimalist but very comfortable and relaxing, to allow the students to socialise and make the most of their downtime. 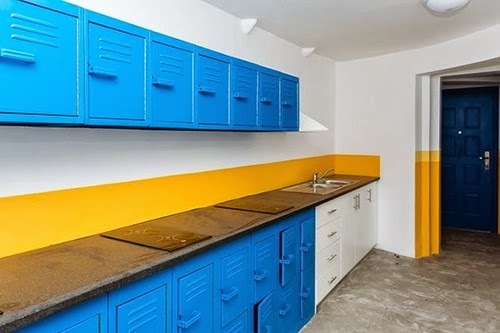 Communal kitchen form two functions. Allow students to learn how to cook if they were not able before, and it helps lower their living expenses, as this option is a lot cheaper than going out and buying the finished, cooked dish. 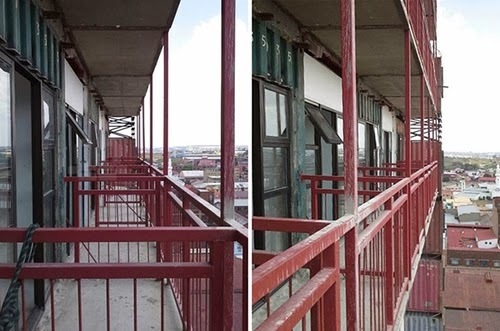 Details of some of the work that went into refurbishing these structures, with a view from one of the windows. This small detail allows student access to another private space, apart from their room, making them feel less boxed in. This is a fantastic use of existing resources, instead of flattening the whole site and rebuilding a new structure in its place. Said like that it doesn't sound like much but if you break it down this is how it goes. You would have to pay to have the Silos demolished, then you have to pay to send them to landfill or to be recycled. If you use landfill all the greenhouses produced in constructing the silos is wasted, because you will have to produce more to construct the new building. Lets not forget about the money it will take to construct the new building. If they had gone for the New Build solution, there is no way they would have been able to be so affordable for the students and the entire precess would have taken longer than 1 year to complete.